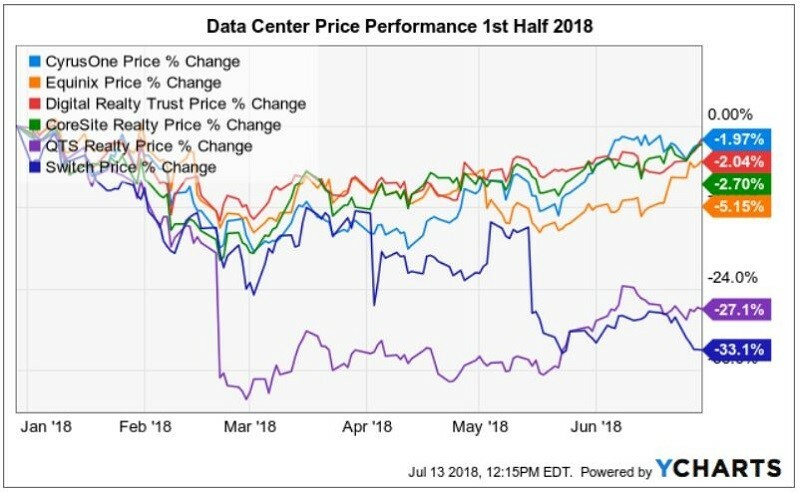 As data center REIT executives burn the midnight oil preparing for earnings season, here’s our recap of data center stock performance in the year’s first half. That’s one of Warren Buffet’s most famous quotes. Another adage often attributed to him is, "In the short run, the market is a voting machine, but in the long run, it is a weighing machine." In that one, the legendary investor was actually quoting his mentor, Benjamin Graham, who literally wrote the textbook on being a successful value investor. Mr. Market is often fickle in the short term. Herd mentality is rampant on Wall Street, where the pendulum constantly swings between irrational exuberance and excessive pessimism. Sectors can fall in and out of favor from quarter to quarter, but thinking long term, savvy investors who understand industry and company fundamentals buy great companies when they "go on sale." Here are two recent examples where certain catalyst events created inflection points, or opportunities to buy where upside was much greater than the risk associated with the downside. There is a lot riding on the upcoming Analyst Day. A five-year growth plan is expected to be revealed. Equinix has an unequaled global moat, well-positioned to take advantage of the digital transformation and distributed IT architecture trends. Now, the company is layering the HIT initiative on top of the retail colocation business model. Investors should always be wary of falling knives. However, my sense is that initiating or adding Equinix shares at current levels will be rewarded by a bounce back following the Analyst Day catalyst. CyrusOne shares traded slightly downward following its first-quarter results announcement and earnings call. The company recently kicked off a global expansion strategy with a $100 million investment in and partnership with China-based data center provider GDS Holdings and acquisition (pending) of Zenium for a European platform. CyrusOne is in the process of becoming the third US-based global data center REIT. Meanwhile, there aren't any issues with key metrics. The ROIC on new development is averaging 15 percent, and EBITDA margins are at 56.5 percent (down 150 basis points due to ramping up for Europe). The sales are there. The growth is there. The capital is being invested with a longer-term horizon. 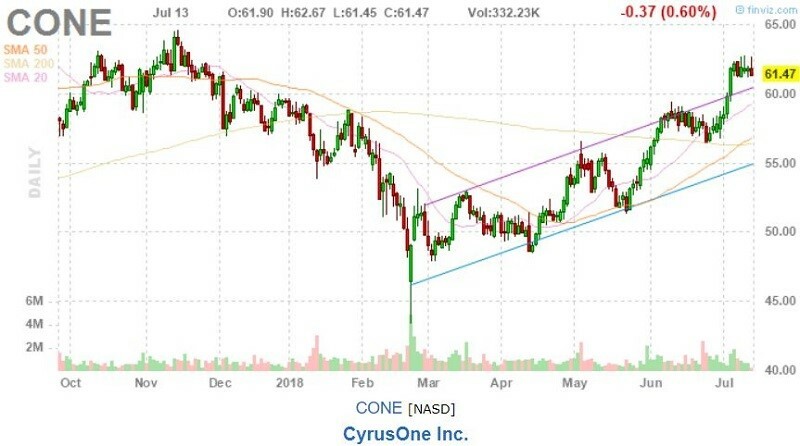 CyrusOne has done good job communicating with investors and analysts. It appears an investment-grade rating could be coming within the next year. The transparency and additional color have been rewarded by a significant increase in share price. This is a valuable lesson some industry peers have yet to fully grasp. 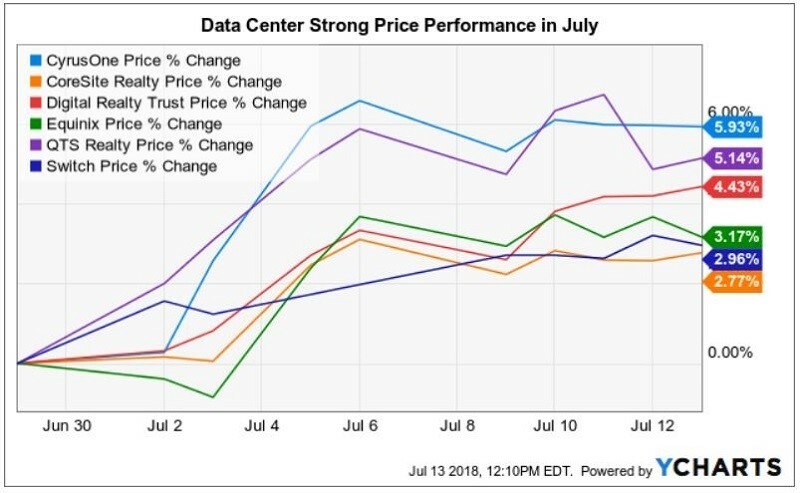 Arguably, the entire data center sector’s rise in July appears to have created a tailwind for shares of both Equinix and CyrusOne. 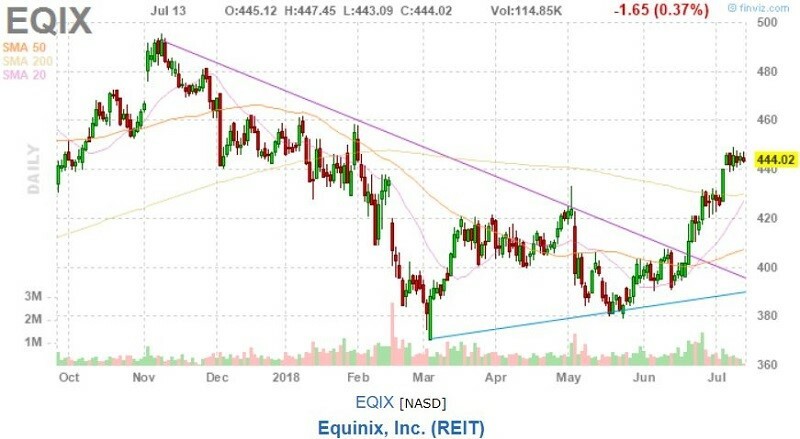 It could also be said that investors and analysts were so impressed with what they heard from Equinix and CyrusOne, that Digital Realty, CoreSite, and QTS Realty all caught a tailwind on the stock market. Separating signal from noise on Wall Street is one of investors’ greatest challenges. Analyst upgrades and downgrades, secondary share offerings, and M&A deal announcements all cause fluctuation in share performance on a daily or weekly basis. But, investors who bought data center stock in May have seen double-digit price appreciation as of this writing. So, even though data center REITs are down to flattish since January, there is always a bull market somewhere, but it takes due diligence to recognize the opportunity and the hutzpah to buy quality companies when the herd is selling them.